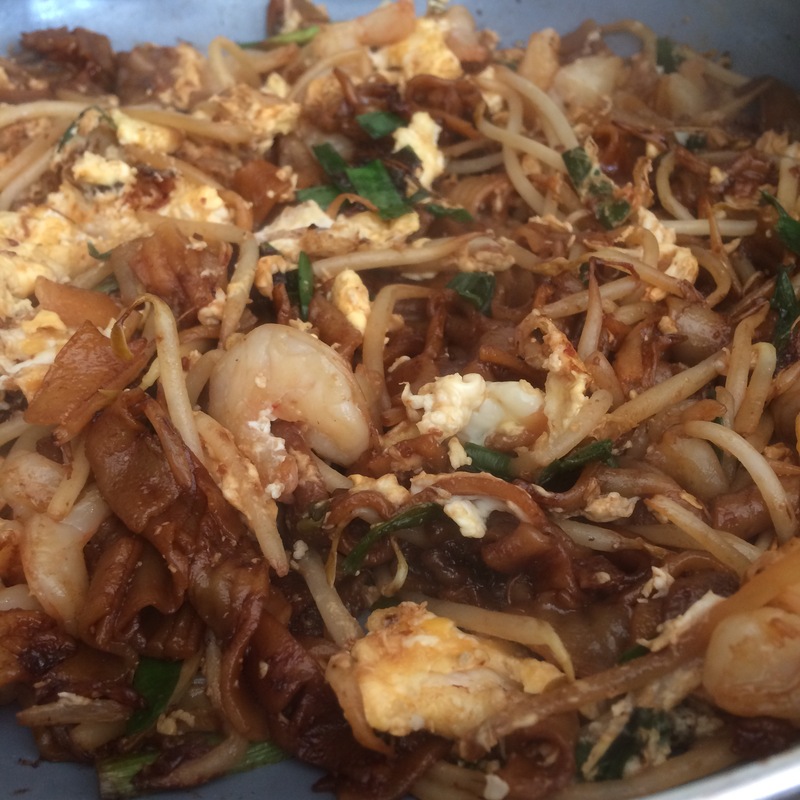 …or, fried flat noodles with prawns and eggs. The photo doesn’t do it justice, but this is one of my favourite things to eat – probably top 5, maybe top 3. It’s a speciality in Malaysia, where half of my family is from, and where my mum learned how to make it by carefully watching (and interrogating) the specialists, who cook nothing else on fiery hot woks in hawker centres and coffee shops. My mother’s is just as good (or better) and that isn’t some kind of fluffy emotional bias talking (we’re really not that kind of family, by which I mean, we’re Asian. “I won a maths prize Mummy!” “Hmmm.”) it’s cold objective analysis. I always request char kway teow when I go home, and order it pretty much whenever it’s on the menu. But I’ve been watching carefully too, and even without a wok, managed to make it at home on my own. All the ingredients for this recipe should be available at even small Asian supermarkets. It’s not really possible to buy them in smaller quantities, and they don’t keep brilliantly, so we either invite people round for this meal, make it two nights in a row (it’s only possible to fry two servings at a time anyway, so it has to be in batches), or eat twice as much as a normal person ought to. All good options. 16 or so shelled king prawns – I buy these frozen from Asian supermarkets for about £10/kilo. Defrost as many as you need with a little salt and baking soda so that they stay plump and juicy. In a small saucepan, gently heat the soya sauces and brown sugar until the sugar has dissolved, then set aside. Separate the kway teow into individual strands – put the whole block into a microwaveable dish with a splash of water and microwave on high for 30 seconds to make it easier. Carefully wash the garlic chives (there can be dirt where the leaves emerge from the stems), trim the very tips of the roots off and any damaged leaves, and slice into 1 inch pieces. Halve the prawns down their spines and devein. Finely mince the garlic. Now you’re ready to fry! Heat about 2 Tbsp of oil in a wok or wide pan over a high heat until shimmering – it should feel uncomfortably hot when you put your hand above the pan. Add half the garlic, fry briefly with a wooden spatula, and then add half the kway teow, the soy/sugar sauce and toss to coat. Push the kway teow to the sides of the pan, making a space in the middle, and add half of the prawns, separating them with a spatula. Fry briefly until semitransparent and mix with the kway teow. Again, make a space in the centre of the noodles and adda tiny bit more oil if the pan is very dry. Break three of the eggs into the centre and break the yolks with the spatula. 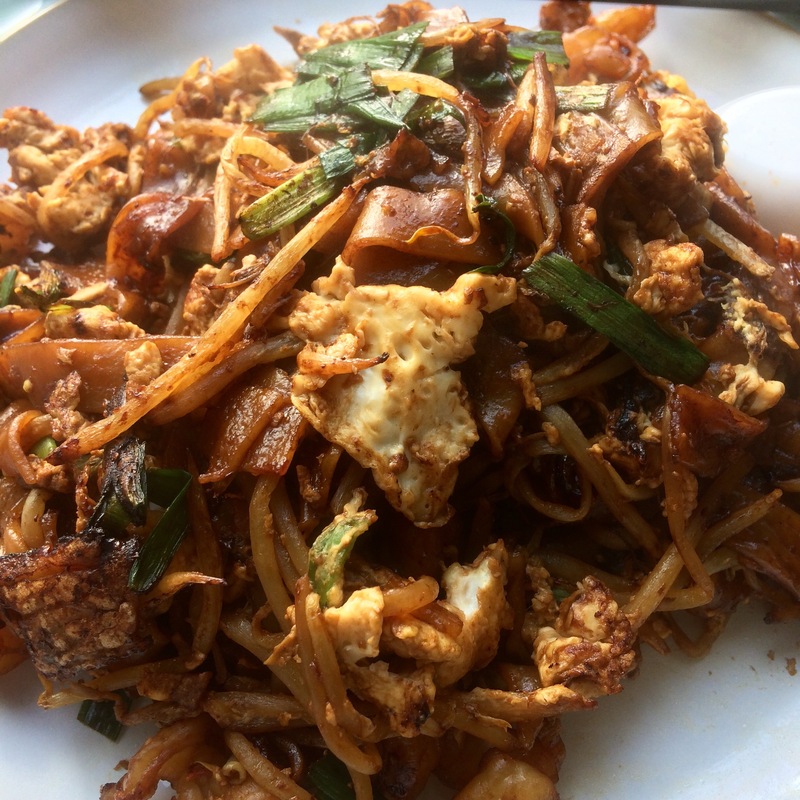 Leaving everything still so that the egg cooks – and you want the kway teow in contact with the pan to be developing a bit of a caramelised char (wok hei), throw half of the beansprouts on top of the noodles. When the eggs are nearly cooked, break up and mix with the noodles/beansprouts – you want everything evenly mixed, but don’t keep it constantly moving because you want to give the wok hei a chance to develop. Taste a little for seasoning – you might want to add white pepper or more soy. Add half of the garlic chives and toss to combine. Get your plates ready – maybe even warm them for 30 seconds in the microwave – as you let the noodles sit and char for the last minute or so. Serve immediately and then either cook the second batch immediately or keep the ingredients in the fridge for up to one day. A while ago, my mother went up to help look after my cousin’s family when her husband was ill – cooking, doing laundry, gardening, sewing…basically everything they’d asked her to do and about a million things more – everything except putting her feet up and relaxing! She also played with my little nieces and nephew, who all agreed that hers was the best kway teow they had ever eaten. And that’s how good this kway teow is. 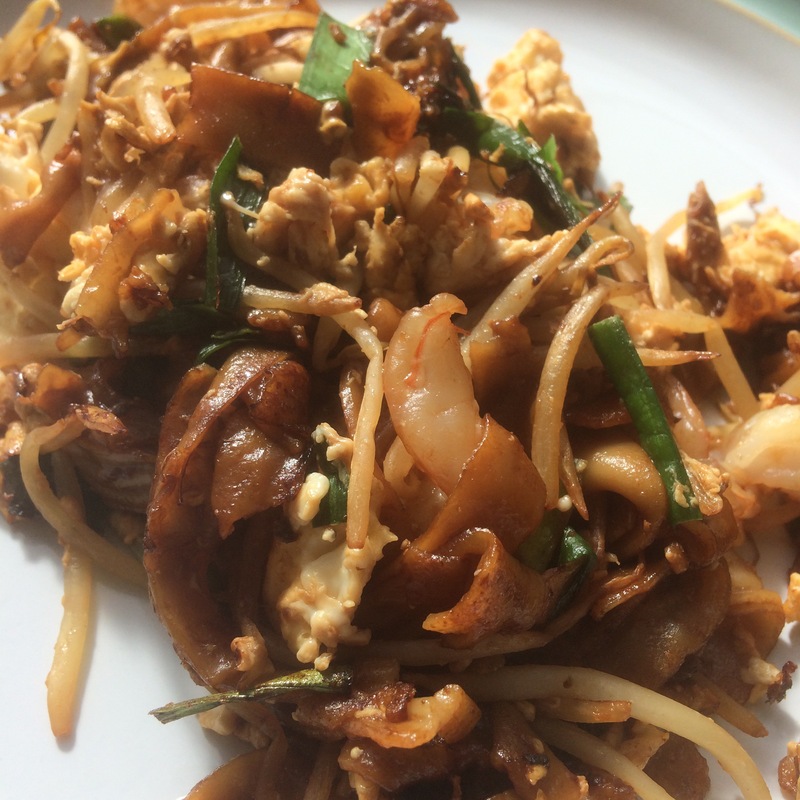 This entry was posted in Asian, Budget, Easy, Quick, Weeknight dinner and tagged char kway teow recipe, food, hawker, hokkien, malaysian, recipes, singapore. Bookmark the permalink.